Whether you're baking cookies or baking bread, this Artisan® series tilt-head stand mixer provide a 5 quart capacity bowl to handle the dough. With 10 different speed settings, this mixer can perform tasks from a slow stir to a fast whip. The mixer’s planetary action touches the bowl at 67 points to ensure your ingredients get thoroughly mixed. Artisan Series 5-quart mixer, 10 speed, tilt back head for easy access to mixture, 1-piece pouring shield with large chute, 67 point planetary mixing action, attachment hub, includes coated flat beater, coated C-dough hook, 6-wire whip, and stainless steel bowl. 325 watts, 120v/60/1ph, Watermelon. Warranty not valid when used in commercial environment. "Don't know how I would be able to survive normal baking tasks without it. I accidentally took on whipping egg whites to stiff peaks by hand a cou..."
"Don't know how I would be able to survive normal baking tasks without it. I accidentally took on whipping egg whites to stiff peaks by hand a couple weeks ago; I thought my hand would fall off and I never got close to the right consistency. I love being able to throw ingredients in and let the KitchenAid do the work for me. They're built like tanks and can power through most batters and doughs." "Used my new mixer last night for the first time....works great! It looks beautiful sitting on my counter top. Never thought I would like such a bold color as Empire Red but really looks good." Great Mixer - It Leterally Cleaned My House! "Got this for the wife for Christmas. She absolutely LOVES the buttercup color. None of our local brick & mortar stores carried the buttercup color, so she was a little worried, but it actually looks really nice. I watched a couple of youtube videos where the KitchenAid stand mixers were rough sounding and seemed to vibrate a bit. However, this one runs nice and smooth and is pretty quiet. The first gourmet thing that we whipped up was a generic box o' brownie mix. Yum. Surprisingly, they turned out better than usual--must be the thorough mixing action. OK, so how did this clean my house? Well, the wife was soooo happy to get this as a gift and she insisted that it lives on the kitchen counter (it would never get used if stored under the counter, right?). So I made her a deal--if the kitchen counters got cleared off (I'm embarrassed to admit how cluttered my kitchen was...), then she can keep it on the counter. Well, it worked. My kitchen has never been so neat, clean, and organized. And I have never had so many baked goodies in a single week. This has inspired us to bake more. Hopefully it lasts (the mixer, the cleanliness, the goodies, and the euphoric emotion). I had never heard of KaTom before placing this order. Lucky for me, Google introduced us. They had the best price on the buttercup color, and they processed and shipped the order super-fast. Smiles all around." "I have this personally and enjoy using it every time I use it.....this company is wonderful to work with"
"I make cookies for all my family & friends my mixer has made this so much easier. I have use it to make dough, cookies, potatoes & many more wonderful treats. I would use my Mother mixer before I got this for my birthday What a Great Present!!" "Quiet, efficient. Only draw back is the mixer is heavy. I keep it on the counter and bought one that matches my kitchen." "I actually bought this mixer as a wedding gift for my niece. I have owned 4 different KitchenAid mixers, all different models, each an upgrade from the last. These are the best machines you can buy. I've been cooking for 50 years and have used a KitchenAid since I was in my mid-twenties. I suspect my niece and her new husband will have this mixer for decades to come." "like the robust feel and operation, even when 'overloaded' with dough and cheese. minor problem with lock on first but immediate replacement just perfect. last one lasted 35 years! hard to stop this product! could use power takeoff in husbands shop!" "This mixer is a beautiful Cobalt Blue. It's a great product, definitely recommend it to the average baker." "Kitchen aid should give us more guidelines with video and recipe on their web site for their product. Very difficult to find useful information at their site, this is disappointing to new users !" 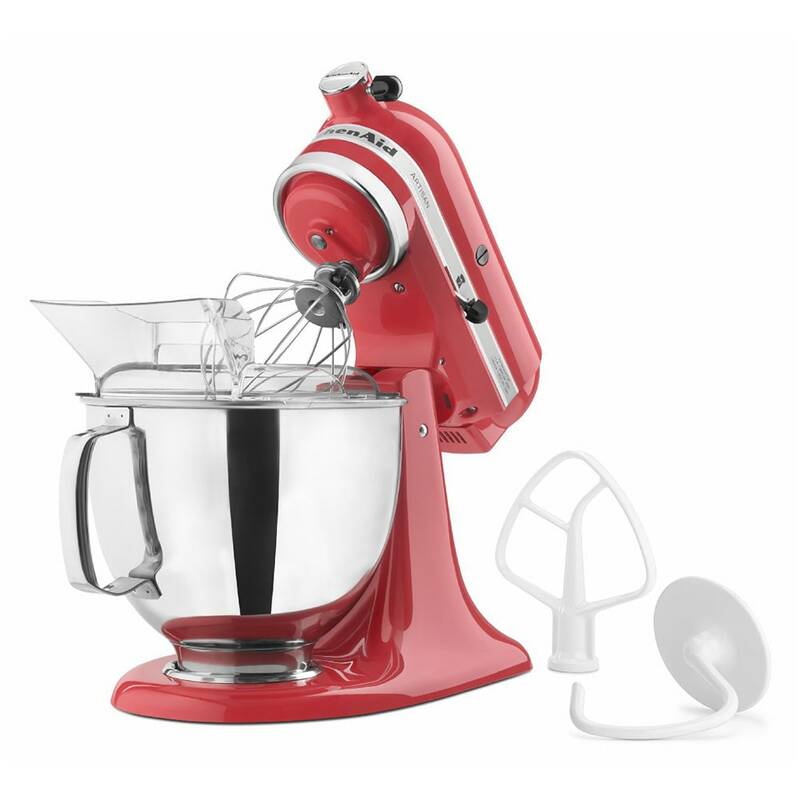 "Love this mixer, not only is it great to use for baking but looks fabulous on the counter. It adds a burst of color to the kitchen and I proudly leave it on display. My only con is the weight (I know that cant be changed). I did find a tray in matching color that after adding chair slides, allows me to slide mixer into position." "The KitchenAid artisan is a great product something I would recommend to people looking for a good quality mixer. It is quiet but powerful. Many useful attachments. Only a couple things you may not like it is heavy and can be hard to use." "Love this product. The color is exactly as shown on the website and I love it." Best Stand Mixer Ever ! "I use my K/A stand mixer 3 to 4 times a week. So far everything works perfectly. I have used it to make bread 4 times and it doesn't hessitate for a second. I shopped for months to get the best price on this model and this was it." "I love my Kitchen-Aid! Ka-Tom's was the best deal I found and had the color I was looking for. I wouldn't own anything but Ktichen-Aid, it mixes and does the job with such ease!" "I have been shopping for months to get the best price on this KA stand mixer. And this was it, at 299.00 and included the pouring shield, wisk, flat beather & Dough hook. Everything was in perfect condition and works great. I ordered on 2/25 and received it on 2/27, talk about fast shipping, WOW. This is my first purchase with KaTom and I am very pleased with their service." "Our restaurant has a 20-quart Hobart, but sometimes that's just too big when you just need to make a sauce or dressing. The immersion blender is a bit much as well. This is just right in our small restaurant"
"This is the perfect gift for a baker. I bought this for Christmas for my daughter and she loves how fast she can whip together all of her favorite recipes and is now trying new ones because it is so easy and quick to get something in the oven. The service and delivery was fast and on time." "First, I went with the "caviar" color. Its not a dark gray, rather a irridescent black. Stunning! Second, made bread for the first time ever for my mixer's debut and it came out perfectly. I couldn't be happier with my purchase. My order was shipped promptly and properly. I would reccomend this vendor." "I'm so glad I decided to buy this! Preparing cake batter and cookie dough is so easy now. And making pizza and bread is so much simpler." "I bought this for my mother-in-law for her birthday and she loved it! Quick delivery, great customer service and awesome price!" "Great vendor fast shipper MY PLEASURE"
KitchenAid recent QC is not so great! "The paint color choice is what attracts people to buy this line of KitchenAid mixer; however, there has been many QC issues after Whirlpool took the brand. One of which is when they install one of the screw on the bottom left of the motor, they scratch the paint on the left side of the stand neck. The first mixer I ordered has a deep scratch/cut and was returned. The replacement mixer I receive today also has a scratch at the same spot but is very minor compare to the first. Also,the power cord is too short." "Excellent mixer. Definitely worth the money." "classic product with great company reputation"
My mixer is a showpiece and a workhorse! "I love to cook for family and friends. I remember my mother's Kitchen Aid mixer, and have wanted one for quite some time. I am not disappointed. It is the same sturdy construction with the same stellar performance. It is truly a classic and it looks beautiful in my kitchen, an added bonus." "I had never used this product until I went to work at my hometown restaurant. It made preparing meals so much simpler; therefore, I decided I must have one." "What can I say, it's a dream! Easy to use, works better than any other mixer I've had! Worth every penny!" "I made the most wonderful Oatmeal Raisin Cranberry cookies. 10 dozen and perfect."